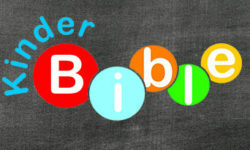 Join us July 15-17 for 3 days of Bible learning for preschoolers! Each morning from 9:30 – 11:30 am your child, ages 4 through complete kindergarten, will participate in sensory learning activities to reinforce the Bible stories. We’re excited about KinderBible and hope you are too!